We’ve all heard that every picture tells a story, but as we amass digital photos from our cameras, cell phones, and friends, sooner or later that narrative starts to get lost. One easy and fun solution is to use some of your favorite photos—the ones that evoke meaningful memories—as the basis for digital scrapbooking pages you can share. iScrapbook 2.1.2 from Chronos is a digital scrapbooking program that brings high-quality design, easy layouts, and a seemingly unlimited supply of scrapbooking bits and inspiration to your desktop as you create pages. You can showcase photos and artwork in a professional layout and add captions and stories to the pages. You can also include other small items (called embellishments) such as ticket stubs, sea shells, buttons, and brads that add to the lifelike quality of your pages. The program downloaded and installed easily—in under three minutes—and the first screen popped up three tasteful albums and one blank layout to begin. I would have preferred more template choices, however. 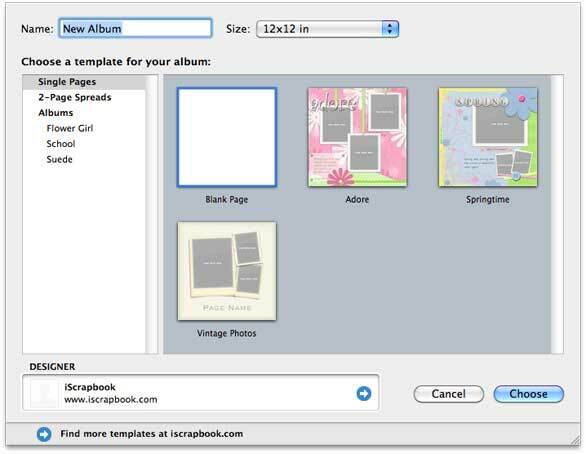 iScrapbook gives you the choice of starting with page or album templates. iScrapbook lets you begin with a single page or an album, depending on the size of the project you want to create. Choosing the Albums feature opens a project with multiple pages, each of which has a slightly different layout but the same overall color scheme and style—basically a theme. After selecting a page template, the new page opens in the iScrapbook work area. The screen design is easy to understand and navigate, even for new users, and the interface features a single window. Context-sensitive smart inspectors show only the tools needed for a selected operation. A new Bin interface, featuring tabs for Graphics, Text, and Favorites, lets you store and access such elements for easy access and repeated use. 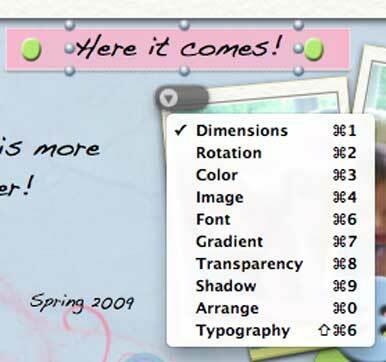 The Graphics tab automatically displays photos already on your computer; you can easily drag images from there and drop them into your page layout or simply double-click the picture you want to add. The layout of the iScrapbook window makes it easy to drag and drop photos onto your page. The program represents a good balance of power and flexibility, which means it can serve the needs of new users as well as more experienced digital scrapbookers. Although the number of tools and the options available for each of the various elements could potentially overwhelm new users, iScrapbook automates as much of the process as possible. Creating an inviting scrapbook page can be as simple as dragging photos to a template, entering your own text, saving, and printing. iScrapbook is interoperable with iPhoto so that you can browse your iPhoto pictures and albums directly within the program. New in version 2 is the iScrapKits browser, which manages your artwork, makes it searchable, and lets you access the online store where you can purchase complete kits or specific graphical elements. This new version of iScrapbook offers a range of other new features: You can vIew pages side-by-side to see exactly how they would appear in books; you can resize multiple objects without grouping; you can export albums in TIFF, JPEG, PNG, and PDF formats; and include a full-screen animated slideshow that you can set up for a one- or two-page display. In addition, new design tools let you group objects, lock objects, create an unlimited number of layers, crop and zoom photos, and customize smart shapes. When you feel ready to take over the reins, you can tailor the layout, change the size and skew of elements, finetune typography with kerning and ligatures, add or remove graphics and embellishments, change backgrounds, and much more. These options are hidden until you click the button at the bottom of a selected element to display them. At that point you can customize the element as needed to fit the changes you want to make on the page. You can customize your layout by changing options for individual elements. iScrapbook 2.1.2 offers a number of finishing options, including the ability to export individual pages or a complete album, printing (of course), or ordering a scrapbook from an online printer so that you have a professional quality, printed book for your efforts. The iScrapbook Store also offers iScrapKits (the first one is free), which include a wide variety of designs from professional artists for paper kits, alphabet kits, embellishments, textures, stamps, and more. The kits cost $3 each, which makes it affordable to add new inspiring elements to your pages. 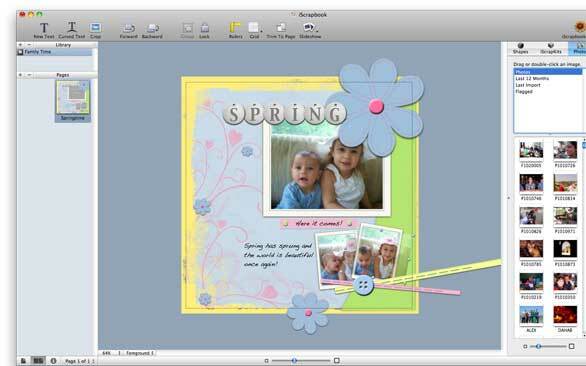 If you plan to put any real energy into your scrapbooking projects, I recommend iScrapbook 2.1.2 for its ease of use, flexible but powerful toolset, easy-to-customize templates, and add-on iScrapKits that let you expand your creative efforts at your own pace. At $50 for a single license, iScrapbook is a great fit for any new or experienced scrapbooker who has creative photo stories to share.